Welcome to the Surfer´s Paradise! ... is based in the resort of Costa Teguise, Lanzarote. The conditions for surfing in Lanzarote are ideal all year round – so you enjoy Lanzarote surfing holidays at any time of the year. The beautiful volcanic island offers amazing wind and wave conditions, whether beginners, intermediate or advanced. And with our highly motivated, professional and experienced team of surf instructors we guarantee everybody amazing surfing in a really good atmosphere. more than learning how to stand on a board. Surfing is a spirit that we would like you to discover with us. The philosophy of our Lanzarote surf school is to provide our customers with professional and individual assistance to a high quality standard. So that everybody, also families and kids, spend a really good, fun and safe time with us. 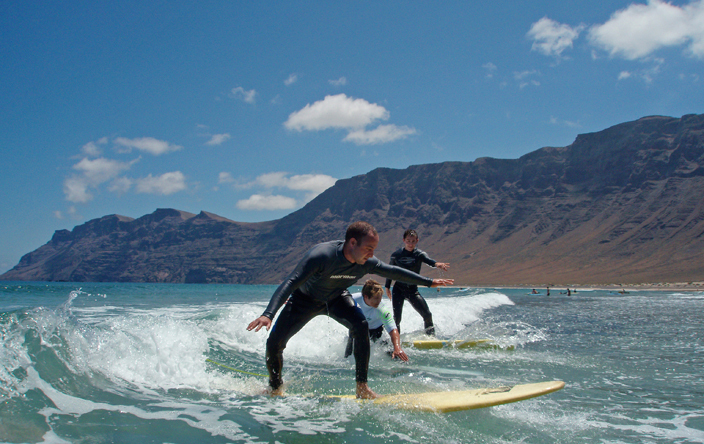 Every day our surf instructors pick the best spot for surfing in Lanzarote that day. We provide you with everything you need, including all equipment, the transfer and a tasty picnic. and not another surfing school? Because our biggest interest is that each person who chooses to surf with us learns and improves the surfing in the way of understanding the techniques and realize them practically. ...are certificated surf teachers with the lifeguard rescue diploma. We keep small surfing groups in order to be able to concentrate on each client individually. You will never see only one surf instructor with more than a group of maximum 8 people in the water. The surf instructors are taking you in the morning, depending on the conditions, to the best surf spot on the island. You will not always, like in most places, surf the same spot every day. Our staff will be with you in the water, next to you when you take your first wave and go with you into details in the break on the beach or on a coffee after the trip. We really want you to spend an unforgettable time and that you will go on surfing after this surf trip you had with us. Another nice aspect of our surf school is the location we are situated, directly on the beautiful beach Playa las Cucharas. In this area around Playa Cucharas you also find a windsurf center, a diving centre, a bike and a trekking station. Let`s say a perfect place to combine sportive activities. We are looking forward seeing you at our Surf School in Lanzarote!